Born in Manchester, England in 1873, Frank Ward emigrated to New Zealand with his family in 1880. He grew up on a bush farm in Ruapuke, near Raglan, and as a teenager headed south to work in timber mills. He learned to survey, and to build bush bridges. 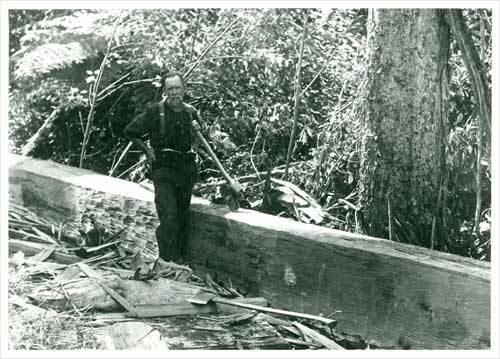 The rest of his life was spent working for sawmilling companies, especially Taringamotu Totara Sawmills, who operated in the rugged King Country around Taumaranui. Frank was a small man, seemingly frail, but his strength in wielding an axe was phenomenal. Working mainly on his own, he built bridges ahead of the bush gangs who felled the trees and readied them to be carted by the loco [bush tram] to the mill. He would survey the loco’s path and then construct the bridges. They were literally carved by hand from massive totara logs. The trimming of trestles and squaring of stringers was done using a broad axe with a much wider blade than usual. In the last year of his life, on 1 January 1956, Frank Ward wrote this poem expressing his love for the bush. And bridges over gullies deep. And I must put my tools away. For bridges that are now to die. Their work is done. I say goodbye. Will surely be a paradise. Frank Ward died on 2 June 1956, aged 83.